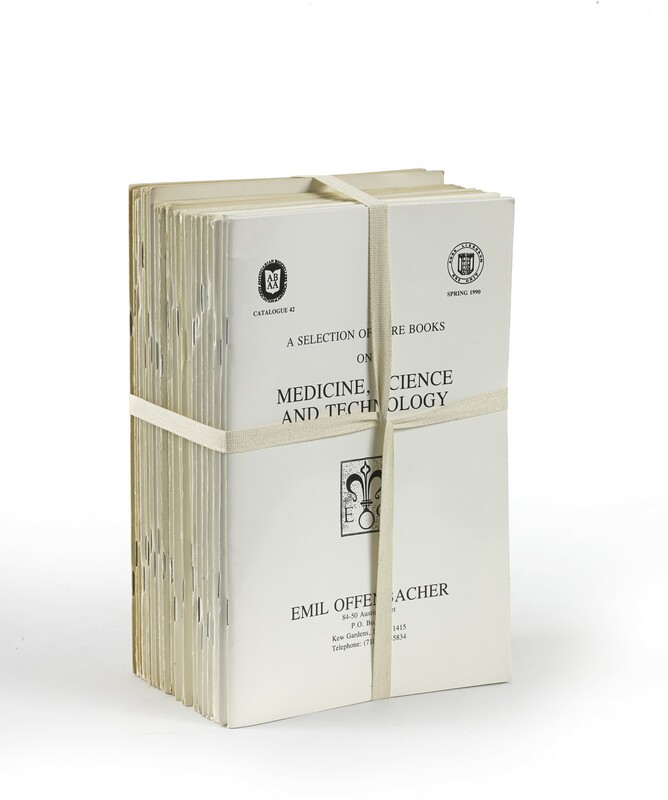 Twenty-four volumes (23 cm), in publisher’s wrappers. - Emil Offenbacher (1909-1990) was apprenticed with Graupe in Berlin and Halle in Munich, and issued his first catalogue in Paris in 1934. In 1941 he emigrated to New York, establishing premises on Madison Avenue together with Erwin Rosenthal. 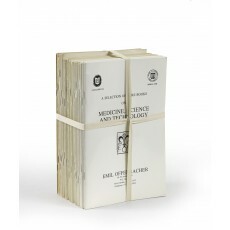 From 1945 until his death in 1990 Offenbacher was based in Kew Gardens, New York, and dealt mostly in early science, technology and medical books. Among his clients were the New York Public Library, the Newberry Library, the John Crerar Library, and the National Library of Medicine; Cornelius J. Hauck of Cincinnati, and Roy Neville of San Carlos, California. See memoirs by Bernard Rosenthal, in Jonathan Hill’s “Catalogue 61: The Reference Library of Emil Offenbacher, Part I” (New York 1991); Lucien Goldschmidt, in The Book Collector, volume 40 (1991), p.260. Cf. Donald C. Dickinson, Dictionary of American Antiquarian Bookdealers (Westport, CT 1998), pp.158-159; Ernst Fischer, Verleger, Buchhändler und Antiquare aus Deutschland und Österreich in der Emigration nach 1933. Ein biographisches Handbuch (Stuttgart 2011), pp.229-230. ¶ Faint waterstain in upper corners of Catalogues 26-27; otherwise in perfect state of preservation. (23 cm), 48 pp. 176 items; priced. Publisher’s printed wrappers. (23 cm), 52 pp. 177 items; priced. Publisher’s printed wrappers. - Autographs (nos. 1-25) and books (nos. 26-177) of Fourcroy, Guyton de Morveau, Lavoisier, etc. (23 cm), 48 pp. 171 items; priced. Publisher’s printed wrappers. (23 cm), 48 pp. 165 items; priced. Publisher’s printed wrappers. (23 cm), 48 pp. 173 items; priced. Publisher’s printed wrappers. - Described in Part III is a collection of Neo-Latin poetry (items 136-173, priced as a group $4000). (23 cm), 48 pp. 176 items. Publisher’s printed wrappers. (23 cm), 52 pp., 179 items; priced. Publisher’s printed wrappers. (23 cm), 64 pp. 200 items, plus Addendum; priced. Publisher’s printed wrappers. (23 cm), 56 pp. 182 items; priced. Publisher’s printed wrappers. (23 cm), 64 pp. 200 items; priced. Publisher’s printed wrappers. 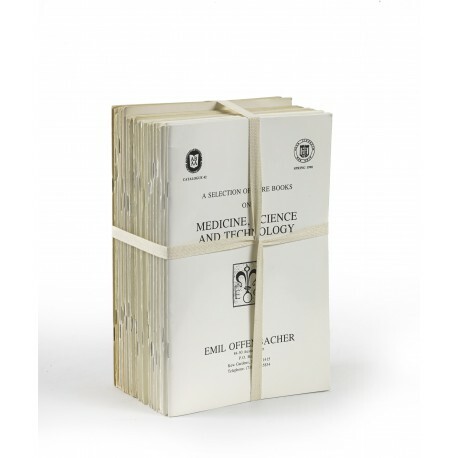 - Contains books from the library of Herbert McLean Evans (1882-1971), obtained in a sale conducted by Swann Galleries, “Herbert Evans library of medical classics”, New York, 31 March-1 April 1975. Included is Mascagni’s Anatomia 1816 (item 79; returned to the market in the sale of the Dean Edell collection, Christie’s, New York, 5 October 2007, lot 117). (23 cm), 52 pp. 161 items; priced. Publisher’s printed wrappers. - Includes (item 30) a copy of Boethius’ Arithmetica (Paris: Simon de Colines, 1521) annotated by Guillaume Postel (1510-1581). This volume (ex-Libri; his sale, Paris, 2 July 1857, lot 1130) had been re-discovered by the Parisian bookseller Jean Viardot, and studied by François Secret (”Notes sur Guillaume Postel. II: Annotations de G. Postel a une Aritmetica de Boèce” in Bibliothèque d’Humanisme et Renaissance, volume 39, 1977, pp.120-123). (23 cm), 56 pp. 174 items; priced. Publisher’s printed wrappers. (23 cm), 56 pp. 178 items; priced. Publisher’s printed wrappers. (23 cm), 60 pp. 180 items; priced. Publisher’s printed wrappers. (23 cm), 56 pp. 175 items; priced. Publisher’s printed wrappers. (23 cm), 56 pp. 177 items; priced. Publisher’s printed wrappers. (23 cm), 56 pp. 176 items; priced. Publisher’s printed wrappers. (23 cm), 60 pp. 192 items; priced. Publisher’s printed wrappers. (23 cm), 60 pp. 178 items; priced. Publisher’s printed wrappers. (23 cm), 48 pp. 159 items; priced. Publisher’s printed wrappers. (23 cm), 40 pp. 120 items; priced. Publisher’s printed wrappers.